Rachel Bride Ashton has been taking part in a new initiative organised by Deveron Projects in Huntly. A north-east arts group has linked up a local painter with an artist thousands of miles away in a war-torn part of the Middle East. 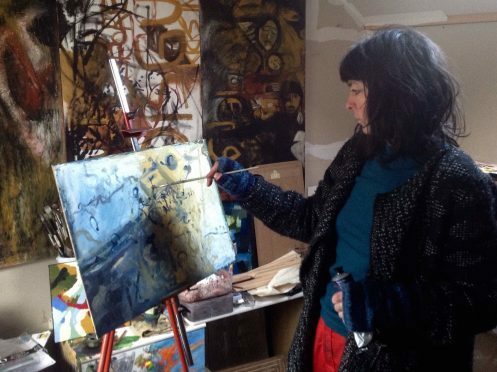 Deveron Projects, based in Huntly, has brought together Scottish painter Rachel Bride Ashton and May Murad, who lives in Gaza. Using online video service Skype, the two artists have been sharing images, videos and sketches of their environment and then painting each other’s surroundings. The year-long project will culminate in two Slow Marathon events in April. The first is on Saturday following a route from Dufftown to Huntly via the White Wood, and the second will take place in Gaza which is exactly one marathon in distance from north to south with walls at both ends. Each artist has been exploring and documenting the route of their respective events. Miss Bride Ashton said: “This project has challenged my practice as an artist. Slow Marathon is an annual event which was initiated by artist Mihret Kebde in 2012. Previous walks have followed old drover routes, the former Portsoy to Huntly railway line and the River Deveron among others. This year’s Scottish walk will see around 100 walkers heading out along the 26-mile route from Dufftown to Huntly.